Our Lily Virginia is a gracious Queen, who has just been ousted from her palace. She was surrendered to us from a family friend to one of our rescue friends in Virginia, after life dealt some unexpected changes and the family was no longer able to keep Lily. Six years young, Lily's options are limited because it seems as though everybody wants to experience puppy hell, and too few people appreciate the considerable benefits of having an older dog, who is well past the puppy mayhem stage. 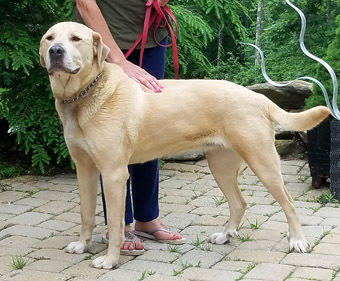 Lily appears to be a mix of Yellow Labrador and Great Pyrenees. 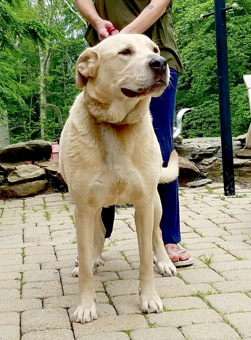 She is a large dog, at 80 pounds, but could stand to gain a few pounds through healthy diet and exercise. Her short flat coat is easy to groom, and is mostly tan with cream markings on her face and feet. 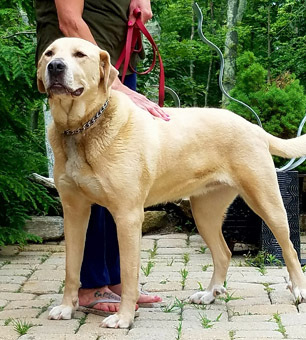 Lily seems more like Yellow Lab in personality, in that she seems laid back, demure, and enjoys the companionship of her people. She seems to have a slight sadness about her, and is likely feeling confused and disoriented with the rescue process. Lily has a very genial nature. She is a sociable dog, and while she has not had much background in obedience, she has grasped the basics and seems to enjoy the training exercises. She certainly is food motivated. Lily is easy to walk on lead, and has a moderate exercise level, although that could increase as she gains weight. Lily would be happy with a couple of leisurely to brisk leash walks daily, and a game of frisbee. Lily would be a great choice for a moderately active single or couple, a recent retiree or senior. She could easily do well in an apartment lifestyle, and can be trusted home alone for short periods of time. She could join a multi-dog home with other laid-back, sociable dogs, and she would probably be fine with cats. 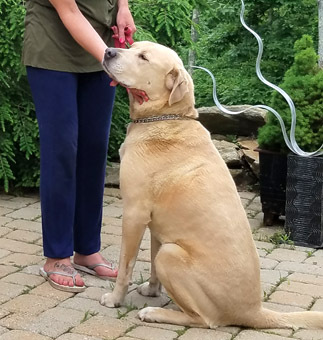 Lily could join an active family with teens, who know how to respect a dog's boundaries, but we think that she might be intimidated by the haphazard handling of young toddlers. 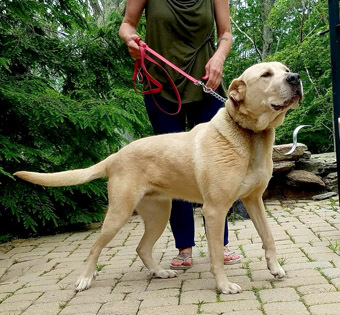 Lily is a pretty good all-around companion dog, and needs to be in an environment where her golden years will be spent as the light of someone's life, rather than considered an afterthought. Lily has good house manners, and is house trained and crate trained. Adopters should expect to troubleshoot the occasional accident that will inevitably occur during her transition to a new home. She is in great health and has been spayed. She is slightly underweight, and would be at an ideal at weight with five to ten pounds added to her 80 pound frame. We recommend a grain free kibble diet with added Omega fats and nutritious natural treats like pieces of apple, veggies etc. Lily has been vaccinated for Rabies, DHLPPC (distemper, hepatitus, leptospirosis, parvo, parainfluenza, coronavirus), and she has been boostered as needed. She has had the 4dx test: negative for heartworm, lyme, earlichia and anaplasmosis. She has been dewormed, microchipped and is on preventatives for Heartworm and Flea/Tick. 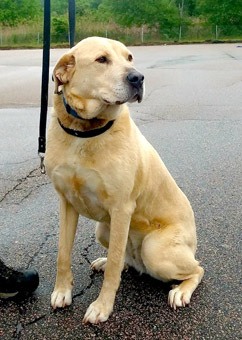 If you are interested in Lily, please write to Denise@eskiesonline.com or call Denise at 860-908-9738 for more info. Eskies Online is a 501(c)(3) Multibreed rescue group that serves unwanted American Eskimos and other dogs in need. Our group of volunteer foster homes spans the North East, and our adoption territory extends from Maine to eastern Pennsylvania, Delaware, and parts of northern Maryland. Once an adopter is approved, we arrange transportation. We do not adopt dogs beyond our territory. Please visit our website: www.eskiesonline.com for more information about our group and our adoption procedures.